Autumn-appreciation outfit of the day. I'm actually starting to like the feeling of autumn. It's getting cooler around here and I can pull out my cozy socks, my thick shorts, my jackets, my scarves. This is my first time wearing these socks and they are ridiculously comfortable. 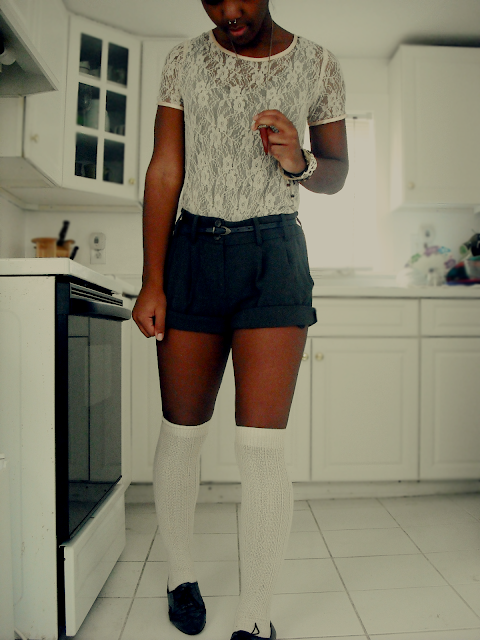 I hardly ever wear these shorts but I really like the fit. Top: lace shirt from Pacsun (on sale), shorts from Charlotte Russe, belt is thrifted, knee highs are from H&M. The shoes are my favorite part because I got them for only $10 and they're one of my favorite pairs.